At this Celebration of Life, Arnie wanted a Dove Release for his beautiful Mother. His Father had died two years prior, so one dove would be for his Mother and one for his Father. Symbolizing that they are soaring toward the Heavens and are together again. It was a sunny, summer Colorado day for this outdoor Ceremony. Guests were gathered under the shade of large trees with views of the lake and surrounded by fragrant flowers. What a perfect setting! 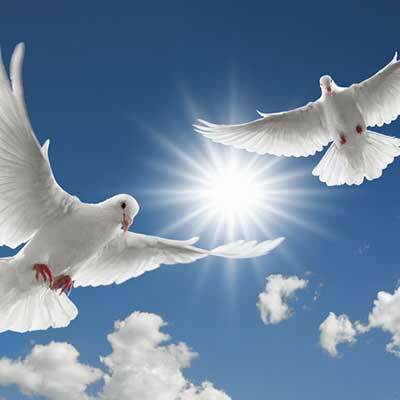 We will close the service today by releasing two beautiful white doves. One dove symbolizes Dawn’s spirit and a new beginning. The second dove represents her husband Gerald, who passed away two years ago almost to the day. May the souls of these loving parents soar together toward the Heavens to find freedom, peace and serenity. I imagined the Dove Release to be quite different than it turned out. I thought he would hold each dove and gently release it up to the sky. That did not happen. He placed the carrier on the ground and opened the door. The doves flew out so fast, it was just a blur. Although we were poised and ready with our cameras, no one got a good photo of the doves. It was still a symbolic and memorable way to close the Ceremony. A family friend played harp music and it was lovely.